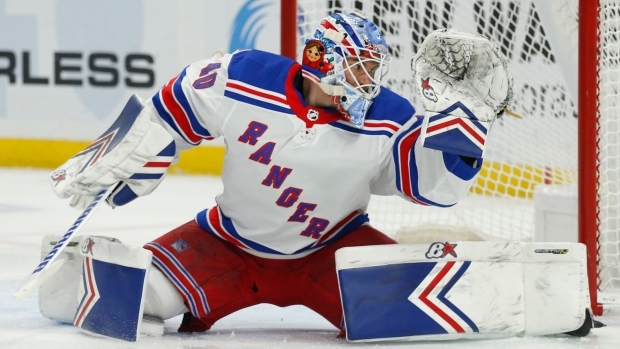 BUFFALO, N.Y. — The New York Rangers were locked up in another tight game before pulling away at the very end. "Seriously, we're on the thread trying to get into the playoff picture, and they're there," he added. "There was a lot at stake especially when you're this deep into the season." The Rangers put it away when Pavel Buchnevich and Namestnikov scored eight seconds apart to make it 5-2 with 3:53 remaining. Buchnevich tipped in Kevin Hayes' pass from the blue line. Namestnikov scored into an open net off the ensuing faceoff after goalie Linus Ullmark misplayed the puck. It caromed off Ullmark's stick and toward the front of the net to Namestnikov, who snapped a 23-game goal drought. "It's a huge relief," Namestnikov said. "I had chances. The puck just wouldn't bounce in. So it was nice to see that one go in." Namestnikov then added an empty-netter with 58 seconds remaining for his first two-goal game since Jan. 25, 2018, for Tampa Bay. The Sabres closed out a 3-3-1 homestand. They were trying to win consecutive games for the first time in more than two months. "It's tough to really pinpoint right now, to be honest with you," captain Jack Eichel said. "Obviously, it's frustrating. We would have liked to end our homestand on a better note. But we play Jersey on Sunday. It's a big game for us." Buffalo squandered a chance to close the gap on idle Pittsburgh in the race for the Eastern Conference's eighth and final playoff spot. The Sabres (28-22-7) remain four points behind the Penguins. Jeff Skinner scored twice for Buffalo, including his team-leading 36th, and Ullmark stopped 23 shots. New York improved to 8-5-1 in its past 14 and earned its 58th point to move into 12th in the East. Jesper Fast and Boo Nieves staked the Rangers to a 2-0 lead in the first period. Jimmy Vesey also scored for New York, which had 10 of its previous 14 games decided by one goal. Georgiev stopped 13 shots in the third period, and was particularly sharp in the opening six minutes to preserve a 3-2 lead. First, he got across to his left to stop Rasmus Dahlin's one-timer 58 second in. Some five minutes later, the goalie squared up in his crease to stop Tage Thompson's shot from the slot. Georgiev won his third straight start. He was coming off a 55-save performance in a 4-1 win over Toronto on Sunday. "I don't know if it's what I'm learning, it's more confirming what I already knew about him is that he's a really good goalie," Quinn said. "He's a lot better today than he was in October." NOTES: Rangers D Brady Skjei departed in the second period after sustaining a lower-body injury. He is considered day to day. ... Sabres RW Kyle Okposo did not return after being involved in a fight with Tony DeAngelo at the 7:51 mark of the third. Coach Phil Housley did not provide an update. ... LW Connor Brickley made his Rangers debut a month after he was acquired in a trade that sent Cole Schneider to Nashville. Brickley played in place of rookie Filip Chytil, who was benched because of what Quinn described as steadily declining play. ... Sabres D Zach Bogosian returned after missing two games with a lower-body injury. Rangers: At Pittsburgh Penguins on Sunday. Sabres: Open three-game trip at New Jersey on Sunday.